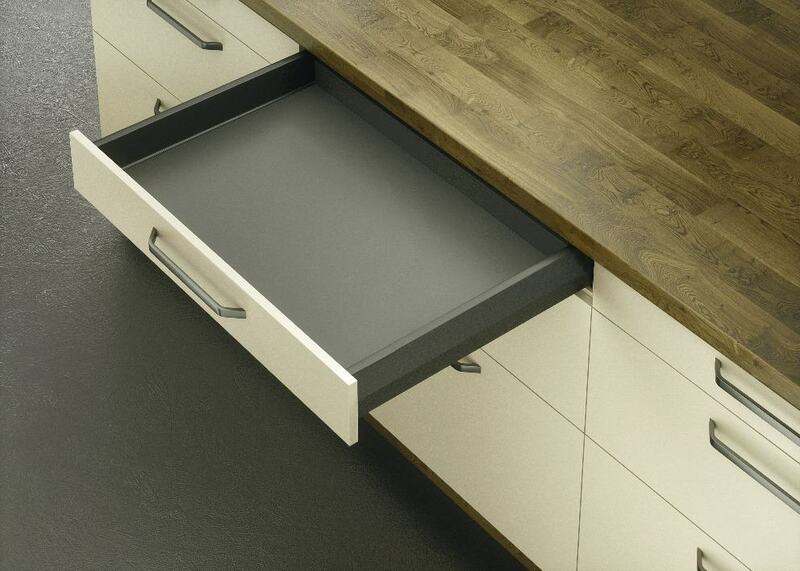 At Elite Cabinets we offer many options for drawers. 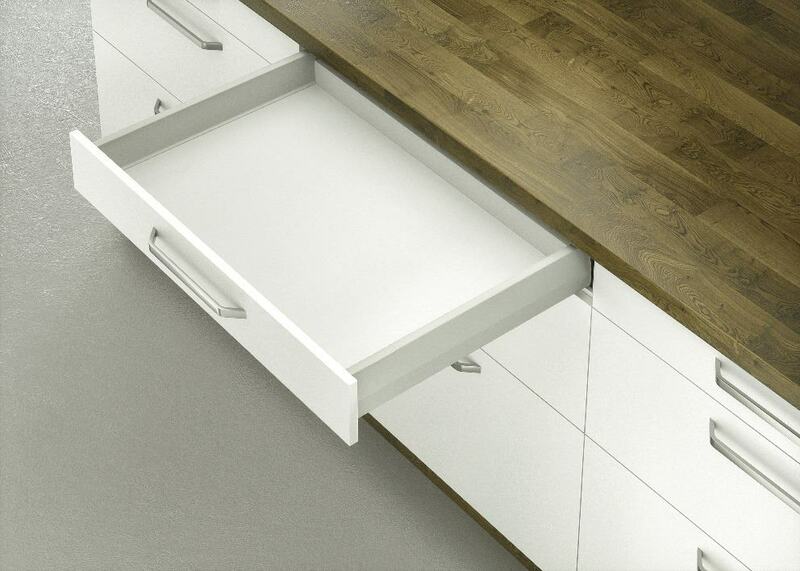 We have adopted several European style drawer systems into our cabinets. 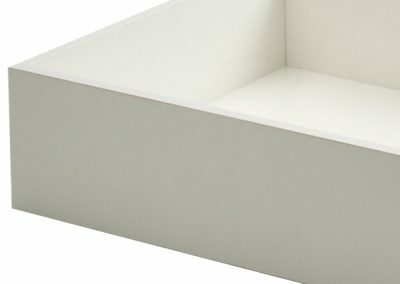 We also offer more traditional style 5 piece drawers in combination with undermount drawer guides as well as side mount ball bearing drawer guides. Browse through our many options and see what style fits you best. 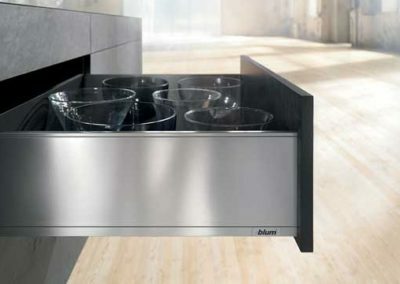 Blum TandemBox: Full-extension, soft-close drawer box system with metal sides and melamine bottoms and backs. 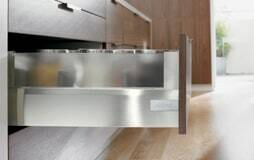 Available in grey or stainless steel. 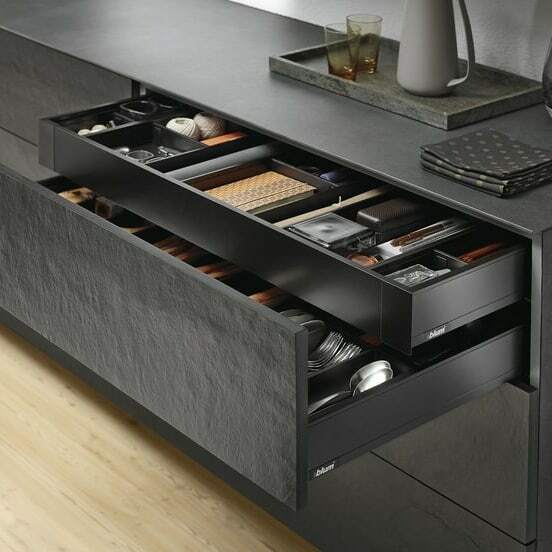 Many design options to choose from, including gallery rails for an open aesthetic, a boxcap for full-height drawers, or a glass design element. 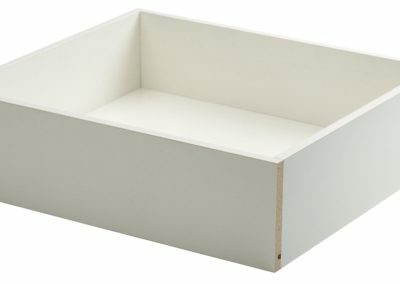 Matching organization options available as well. 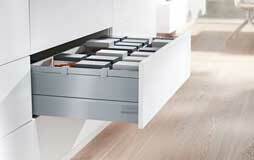 Hafele Moovit/MX: Full-extension soft-close drawer box system with metal sides and melamine bottoms and backs. 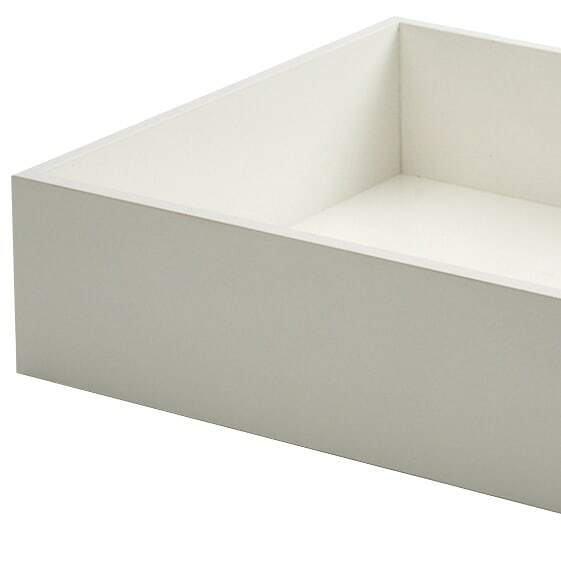 Available in charcoal grey, champagne, or white. 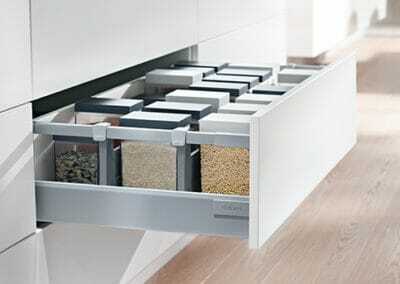 LegraBox: Full-extension, soft-close drawer box system with full-height metal sides in stainless steel or charcoal grey. Concealed, fluid running action guides combines Blumotion soft-close and Tip-On push-to-open technology for a fully functional drawer system. 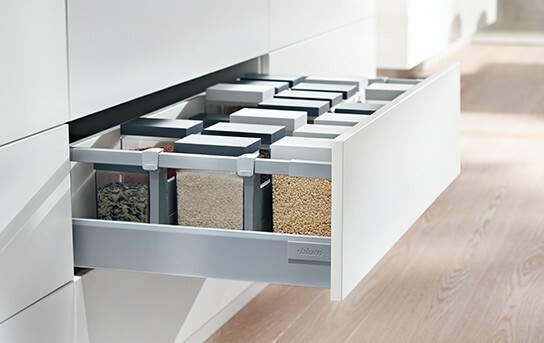 MetaBox: Economical steel drawer system with melamine bottoms and backs available with Blumotion soft-close technology. 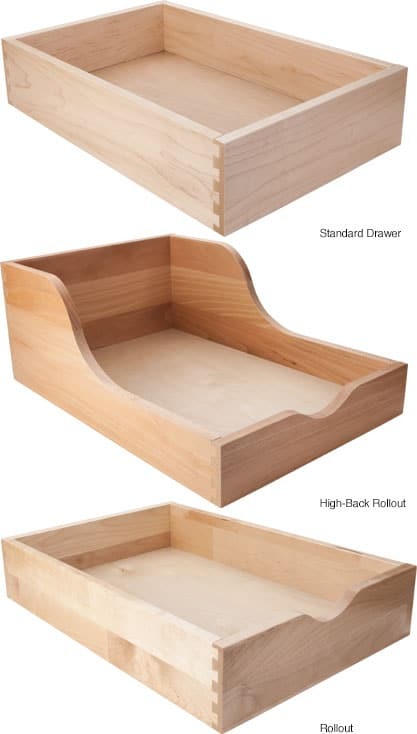 Materials for use with 5 piece drawers. 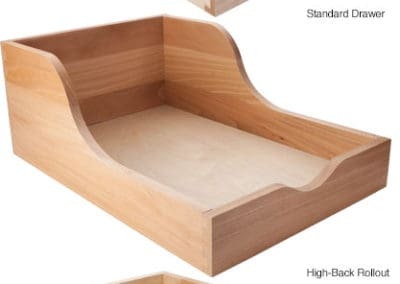 Prefinished Dovetail Maple drawer boxes: UV-coated hard maple drawer boxes constructed of 5/8” solid maple sides joined together with dovetail construction and ¼” bottom panel. 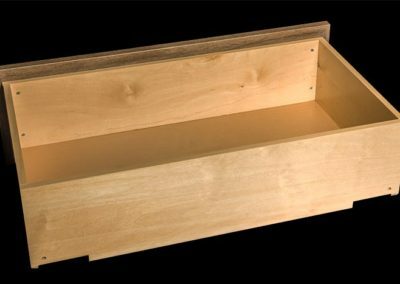 Prefinished birch plywood drawer boxes: Constructed of 5/8″ or 1/2″ UV-coated plywood with edgebanding applied to top edge. 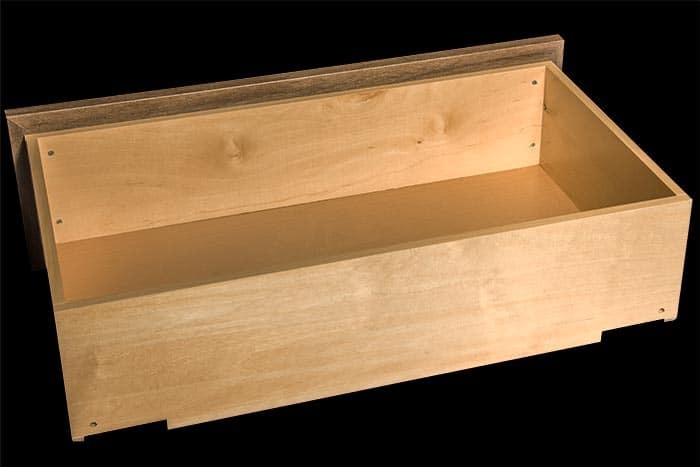 Melamine drawer boxes: Constructed of 5/8″ or 1/2″ 2 sided melamine with edgebanding applied to top edge. 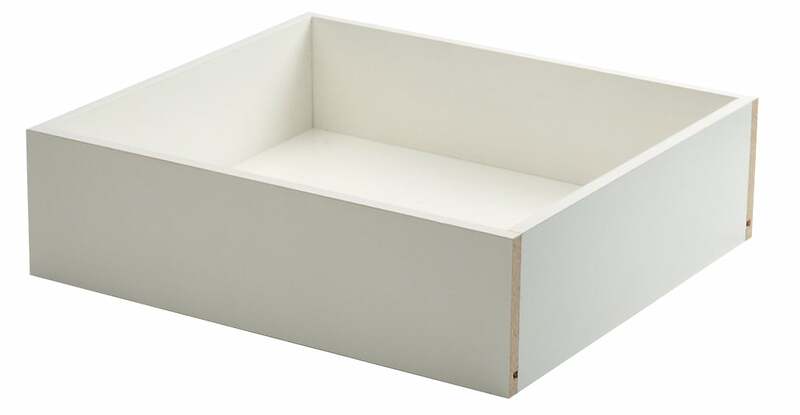 Folkstone grey and white are standard colors for this option. 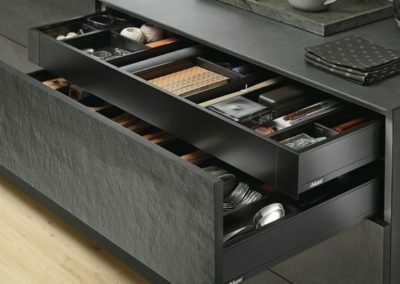 Drawer guide hardware for use with 5 piece drawers. 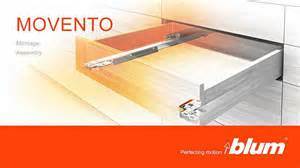 Side mount full extension ball bearing guides. 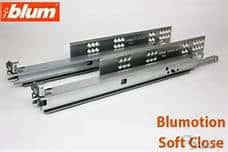 Blum Tandem plus Blumotion: full-extension, ultra-smooth under-mount drawer guides, typically used with our dovetail maple drawer boxes with soft-close but available with all 5 piece drawer options. Movento with Blumotion and Tip-on: full-extension, ultra-smooth under-mount drawer guide used with our dovetail maple drawer boxes, combines Blumotion soft close with Tip-On technology as an option, giving you the option to have a soft-close drawer as well as push-to-open. 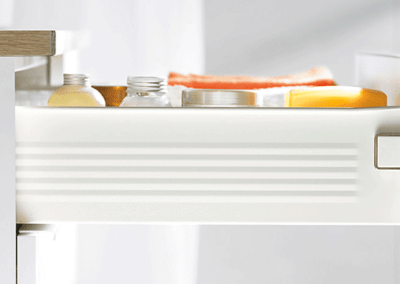 Combine with Orga-Line drawer organizers for the most efficient kitchens and bath.